Smells Like Brownies is turning 3! I can hardly believe it. So I thought I should share a bit of a throwback recipe with you. In fact, this is the first recipe that I ever altered on my own for any reason. It was the beginning of my culinary journey. All in the humble wrapper of a morning muffin. When I was a freshman in college, I suddenly realized that I didn’t know how to cook. I think, up ’til that point, I had assumed that I would just wake up one day and know the tricks of the trade, maybe learning it through osmosis or something, simply because my mom was a good cook. But…I wasn’t even sure how to read a recipe unless it came on the side of a mac ‘n cheese box or would result in chocolate chip cookies. So I set about learning to make something easy. Something I craved on Sunday mornings. 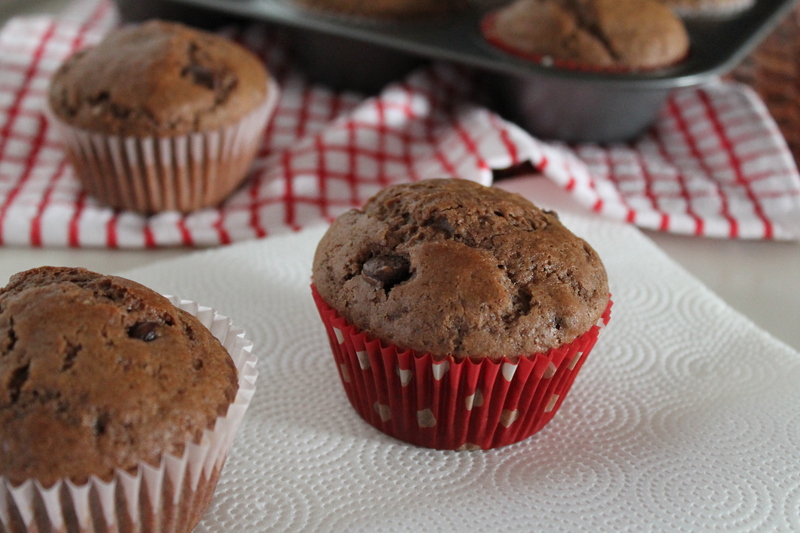 Muffins. I made muffins like three times a week. I invited friends over to make muffins. 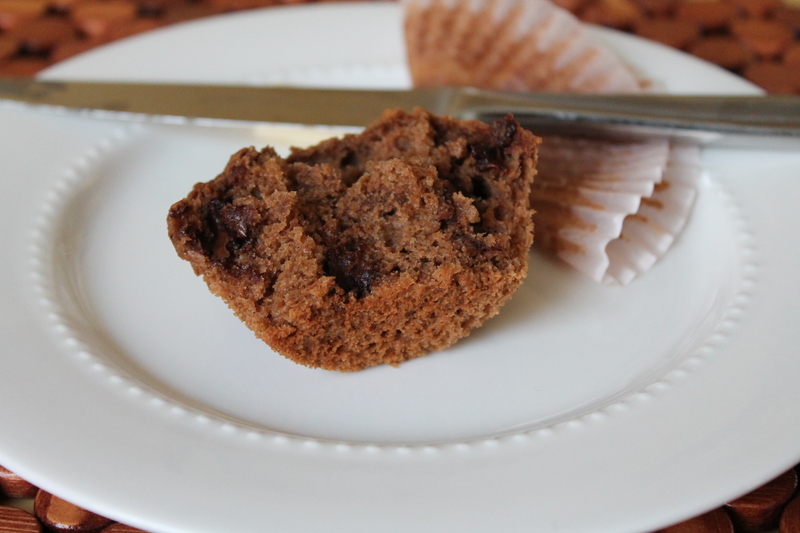 It was a muffin party (complete with a muffin top I hadn’t anticipated…). And so my mom bought me my first cookbook ever, Muffins. It didn’t turn out to be a great cookbook, in case you were wondering, but it did make me realize I could, say, add spices to a vanilla muffin and make spice muffins. Use honey instead of sugar and make honey muffins. 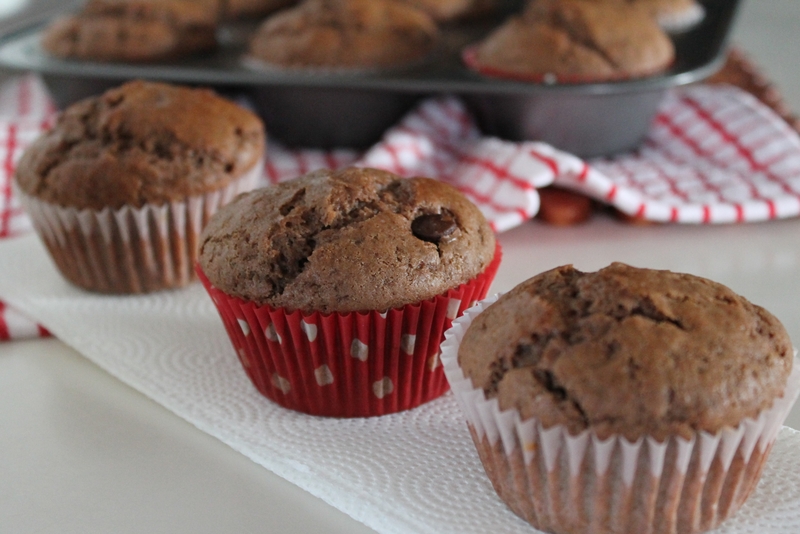 Add cocoa powder and make chocolate muffins. The possibilities were endless! This chocolate spice combo turned out to be one of my favorites. I tweaked the spices ’til I liked them, and I had never felt so proud of my budding kitchen prowess. So now, on my third blog-birthday, I will share them with you! As I said, muffins are incredibly easy to make. Measure and stir. Bake. Done. These chocolate muffins aren’t particularly seasonal (although we did still have snow here last week…), but don’t worry! The spice is light, barely warming, just to add depth to the cocoa. These days, when I make muffins or some kind of indulgent sweet breakfast, I usually substitute whole grain flour or cut back on the sugar so I won’t feel so guilty about my nutrition choices. But sometimes, you just need a good, old-fashioned treat. So I skipped all the nutritional hemming and hawing this time and just made a light, fluffy, crumbful chocolate muffin. Whisk together the flour, sugar, cocoa, baking powder, salt, and spices (you may exchange spices if you wish to; allspice is most classic in spice muffins, but I felt like it was heavy and unbalanced by itself, and ultimately I decided to remove it altogether. But please work within the confines of your spice cabinet and taste buds!—that is the spirit of this throwback recipe, after all). A note on baking powder: different types of baking powder can lend a sort of tinny taste to baked goods. I highly recommend Rumford if you can find it, and buying a small container (for freshness) unless you can use a large amount of baking powder in less than 6 months. Now whisk the egg well. Combine it with milk and oil. Stir the wet ingredients into the dry. Here’s the rule of thumb for muffins: you want the batter to be lumpy. This is what gives muffins their texture. To avoid over-stirring the muffins, add the chocolate chips after two or three strokes, and then stir juuuuust until you can’t see any large streaks of flour. 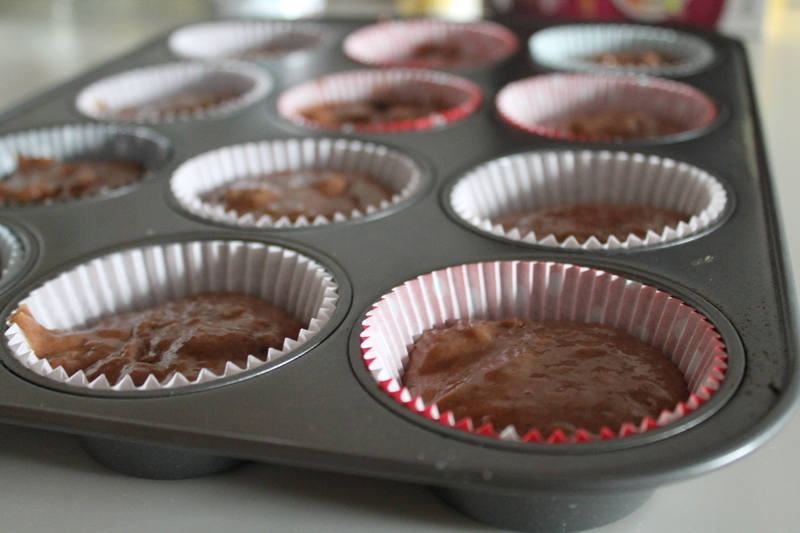 Scoop the batter into a lined muffin tin. Bake for 18 minutes. The muffins should be puffed and the tops should spring back if you press lightly. Serve the muffins warm with butter. And coffee. And more muffins. 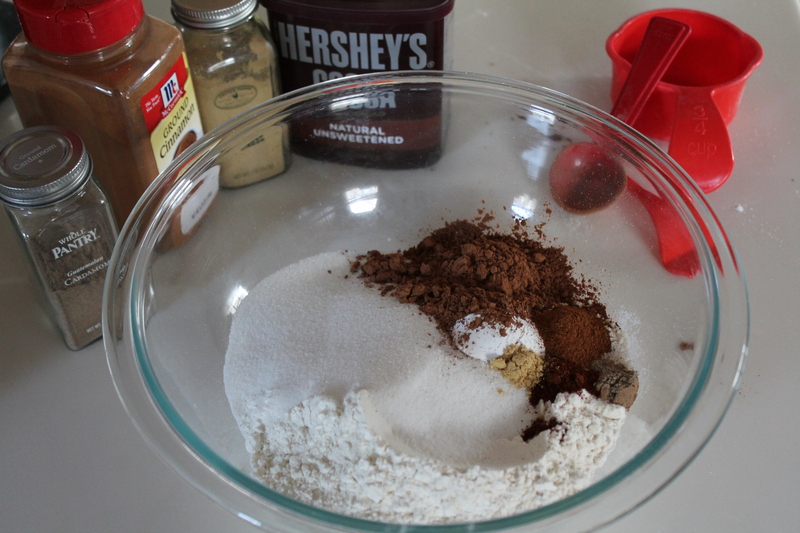 Mix together flour, sugar, cocoa powder, baking powder, salt, and spices. Beat egg lightly. 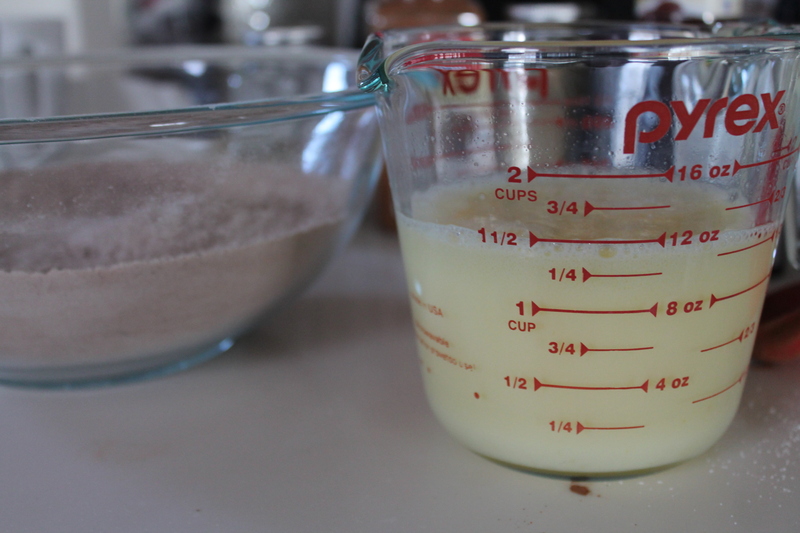 Stir egg, milk, and oil into the flour mixture until just moistened. 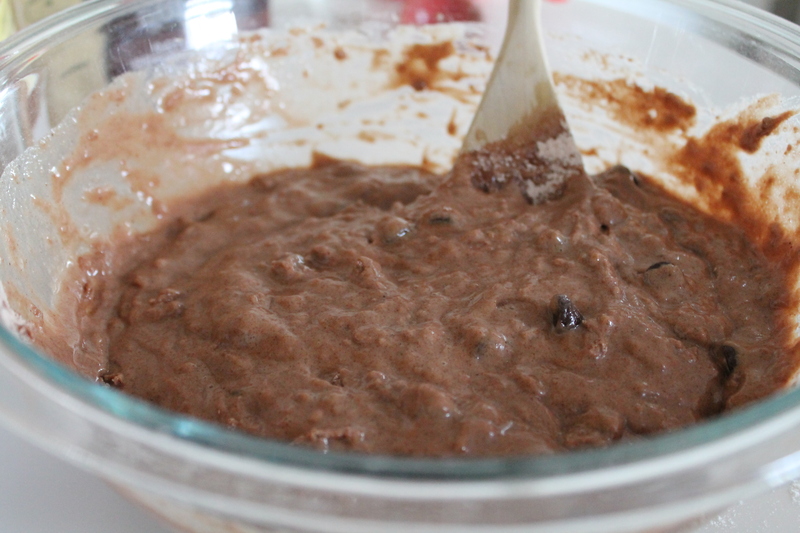 Add chocolate chips and stir just enough to incorporate. The batter should be lumpy. Be careful not to overmix lest the muffins become tough and chewy. Line a muffin tin with paper liners. Fill muffin cups ⅔ full.